Always cook chicken, rolled and stuffed meats, tenderized, marinated and moisture enhanced meats, sausages and minced meat, such as hamburger patties and sausages, so that in the centre of the thickest part the temperature reaches 75°C. This is because food poisoning bacteria can be present all the way through these types of meat products as well as on the surface and only thorough cooking will kill them. 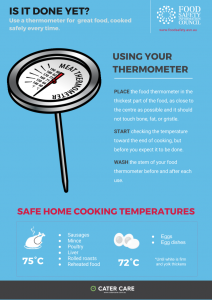 See more details on safe cooking temperatures. To check whether these foods have been sufficiently cooked to 75°C you need to use a meat thermometer.